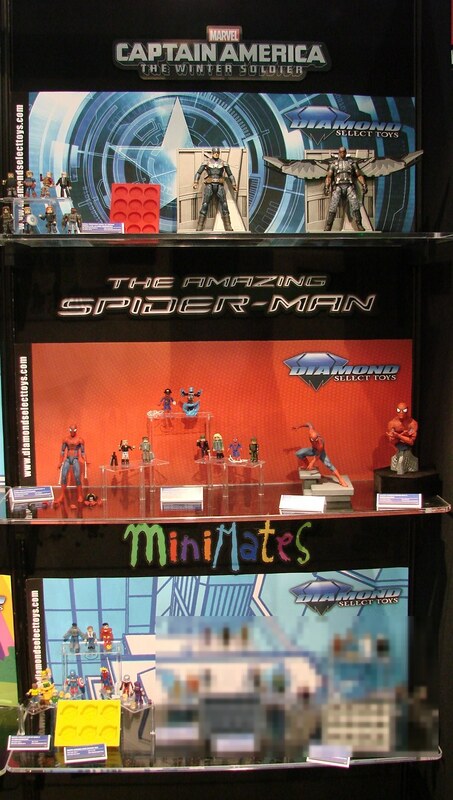 Diamond Select Toys at New York Toy Fair 2014! The past few months have been one of the busiest times in DST’s history, as we prepped a ton of new licenses and products for New York Toy Fair! 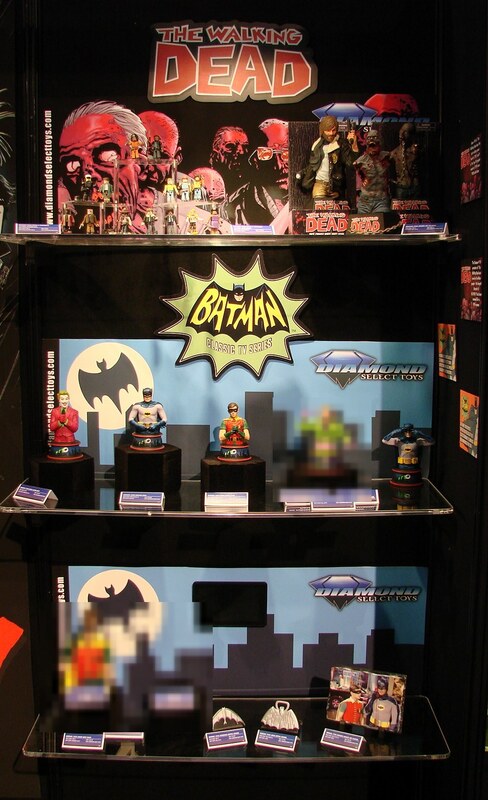 We can’t show you everything that’s in development, but check out these pictures of the booth to see what every retailer saw when they came by to place their orders for 2014! Based on the comic book series by Robert Kirkman, The Walking Dead Minimates Series 5 and 6 were on display, as well as the newest vinyl bust bank, Michonne’s second Pet Zombie! 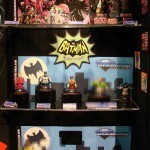 New resin busts of the Joker and the Riddler joined Batman and Robin, as well as an upcoming exclusive: Bat-tusi Batman! 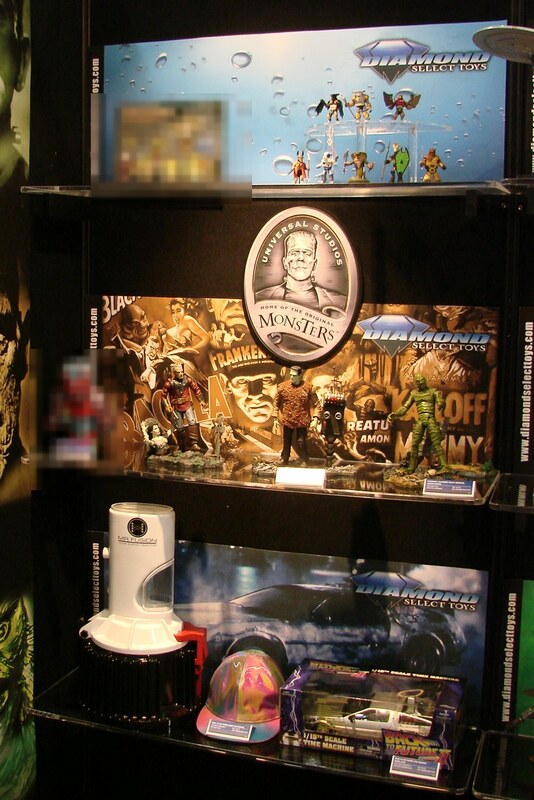 Two vinyl bust banks, two metal bottle openers and a piece of Granix slate artwork were on display, as well. 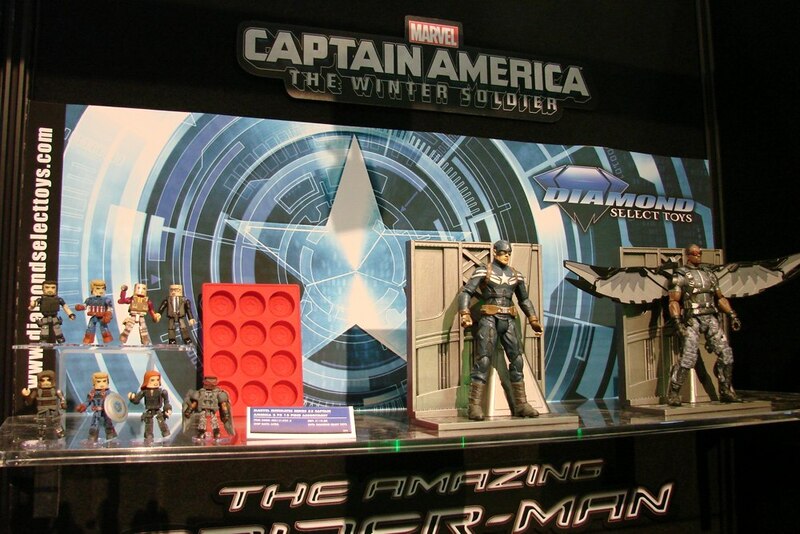 DST had new Minimates and Select figures on display for Captain America The Winter Soldier and The Amazing Spider-Man 2, as well as top-secret Minimates for Guardians of the Galaxy and X-Men: Days of Future Past. 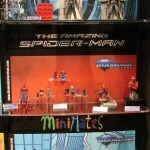 Plus, some returning Marvel Select figures, as well as some all-new silicone trays! DST unveiled their first three vinyl banks for the popular animated series, and while we can’t show them to you yet, they look awesome! 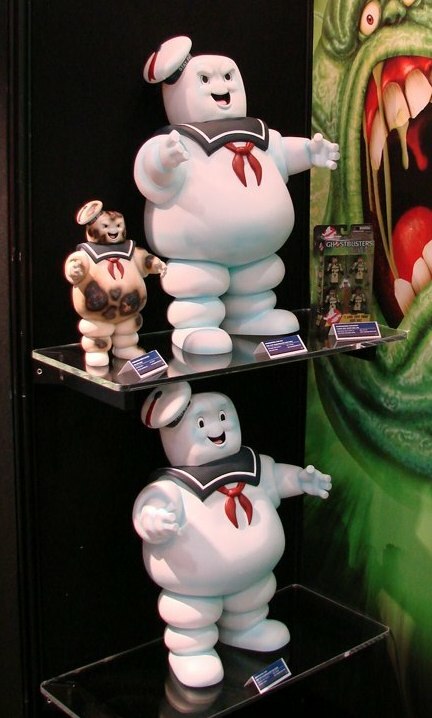 THe two 24-inch Mr. Stay-Puft banks (regular and evil versions) were on display, along with a new 11-inch bank of Battle Damaged Mr. Stay Puft. Does anyone smell roasting marshmallows? A new line of drinkware featuring various fictional establishments was unveiled at the show, including Biff Tannen’s Pleasure Paradise (Back to the Future II), Kadie’s Club Pecos (Sin City) and Jack Rabbit Slim’s (Pulp Fiction). 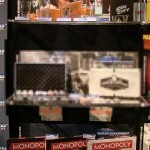 Plus, flasks and poker chip sets! DST announced they’d be teaming up with USAopoly to make games based on Sin City, Back to the Future II and Jay & Silent Bob Strike Back. Board games will never be the same! A line of 7-inch Select-style figures is still pending approval, but figures of the Bride, Go-Go and Johnny Mo are scheduled for Summer, with Bill, Bud and O-Ren scheduled for Fall. Plus, three box sets of Minimates were good to go, featuring the House of Blue Leaves battle, the Crazy 88s, and the Bride with her three teachers: Bill, Pai Mei and Hattori Hanzo! 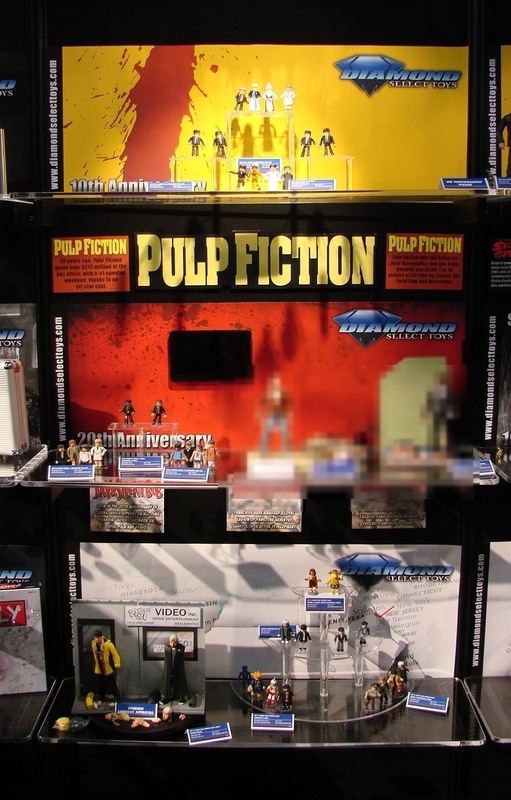 Our Pulp Fiction Select figures were also pending approval, but Butch, Marcellus and Jules are slated for the fall, with Vincent folowing in Series 2. We also kicked off the Pulp Fiction Minimates line with a Jules & Vincent two-pack, plus two scene-specific box sets to follow. 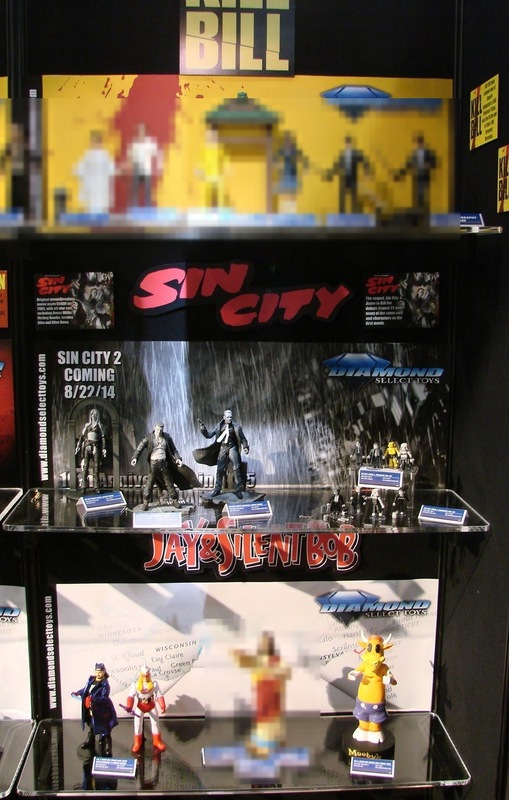 Based on the original 2005 movie, DST will bring out three poseable Sin City action figures this summer, just in time for the sequel. 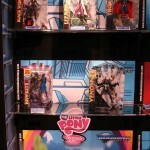 Marv, Hartigan and Nancy start off the line, and series of storyline-specific Minimates box sets will start soon after! 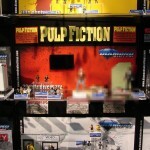 Select action figures of Jay and Bob from Jay & Silent Bob Strike Back led off the items on display, followed by a series of Minimates box sets and two vinyl banks of Mooby and Dashboard Jesus! 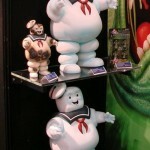 A pair of 8-inch figures from the 2001 superhero film were on display, part of a recently uncovered trove of Bluntman & Chronic merchandise. DST is bringing these back to stores! A new box set of Minimates based on the popular roleplaying game was kept under wraps, as was artwork of a goblin vinyl bank. The second assortment of Battle Beasts Minimates will hit this summer, in packs of two, available at specialty stores and comic shops. 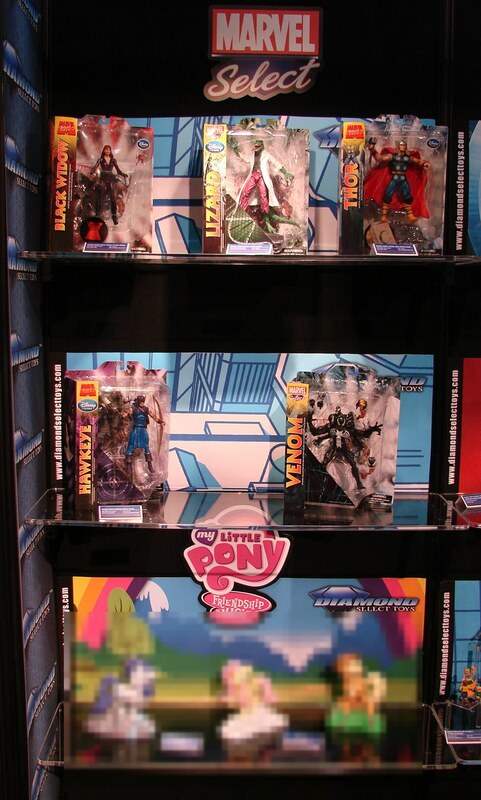 Based on the IDW comic book, the assortment includes a bear, cow, hammerhead shark and cobra. The last three Select figures — Van Helsing, the monster from Son of Frankenstein and a new Creature from the Black Lagoon — were all on display, as was a vinyl bust bank of the Metaluna Mutant from This Island Earth, which was still pending approval. The Mr. Fusion prop replica is still in development, but new runs of the Marty McFly hat and our popular electronic Time Machine were also announced. The U.S.S. 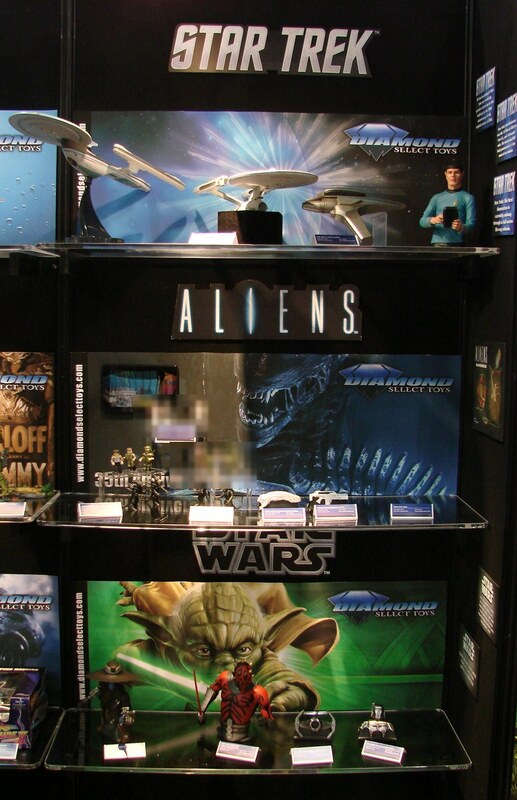 Excelsior, Star Trek III phaser and revamped Enterprise-A were all on display, but not shown were the new Kirk vinyl bank and the Star Trek Select Worf figure! 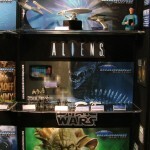 The army-builder assortment of single-packed Aliens Minimates were on display, along with the first series of two-packs, plus a new box set based on the original Alien. Two bottle openers, of an Alien head an a Pulse Rifle, were on display, as was a vinyl Alien bust bank and artwork of an Alien egg bank with facehugger. 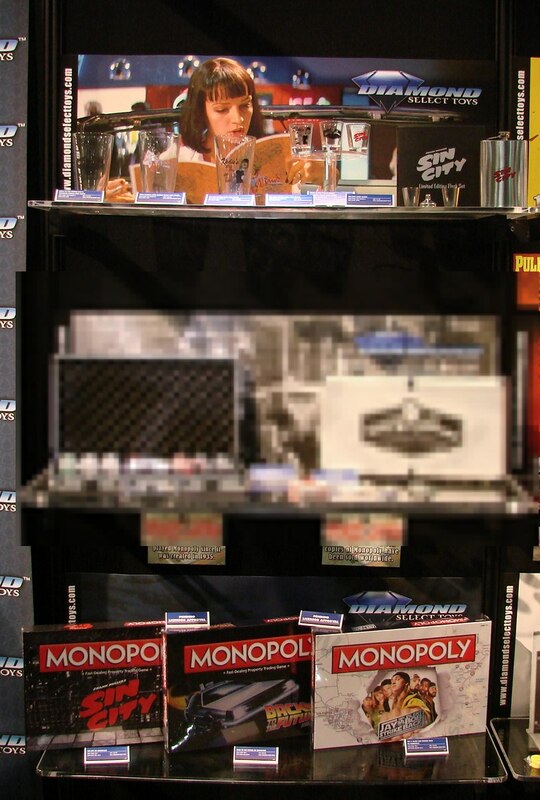 The Cad Bane bust bank, which ships next week, stood alongside the Darth Maul bust bank, which shows him in his Clone Wars look. 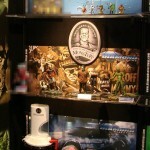 Two metal bottle openers, of Boba Fett and a TIE Fighter, were also on display. A range of banks, bottle openers and Minimates were revealed, based on the classic Godzilla films and kaiju we’ve grown to love. The new console game (based on the popular mobile game) will get action figure two-packs this summer, as well as Minimates box sets and even a vinyl bank of the massive Yeti! 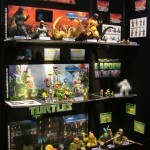 Four vinyl banks based on the current cartoon series were the highlight of DST’s new TMNT offerings. We can’t show you the assortment of Minimates we have in the works, but you can see the pizza cutter as well as the classically styled bottle opener, both featuring Michaelangelo! Present, but not visible, was our electronic B-9 robot from the classic TV show. Development continues! Stay tuned for more images and info! 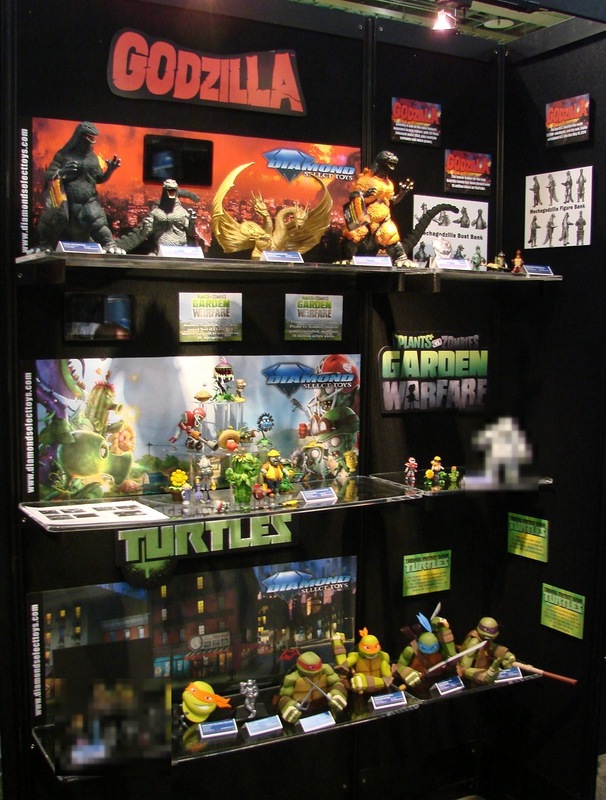 Coming this Fall: New Items in Previews for June 2014!